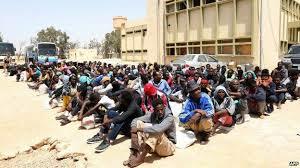 About 116 illegal Nigerian migrants trapped in Libya, on Wednesday, returned to the country through the assistance of the International Organisation for Migrants (IOM). They were brought back aboard an Al Buraq Airlines with flight number UZ 489 which arrived the Murtala Muhammed International Airport (MMIA) cargo wing at about 12:40am on Wednesday. The repatriated Nigerians comprised 53 females and 63 males. Among them 46 adult females, two female children and five female infants. There were also 56 male adults, six male children and eight male infants. Some of them had been held for months at various detention centres for the breach of immigration laws of the north African country. While receiving the returnees who had failed in the quest to proceed to Europe enroute Libya, the Acting Coordinator, National Emergency Management Agency (NEMA) South West Zone,Mr Segun Afolayan acknowledged that migration is a fundamental right of every human being, but however noted that when a man or woman embarks on an irregular journey that breaches the laws of other countries, then such a country has the right to apply sanctions on the culprit who is considered an as illegal migrant. Afolayan said to mitigate the frustrations of Nigerians who have genuine or legitimate reasons to migrate to other countries, but donâ€™t know how to go about it, the IOM in partnership with the Federal Government had opened a Migrant Resource Centre for Nigerians to facilitate their movements legally abroad. The Centres are located at the Federal Ministry of Labour and Employment offices at Benin, Lagos and Abuja. â€œThis centres are created to stem the gaps of inadequate information that many returnees have been complaining about,â€ he added. U re welcome to ur country...no place like home..